Welcome to Island Time Kid’s Place! Island Time Kids is a children’s outreach program of Island Time Ministries. Our mission is to provide high quality, affordable activities for school-aged children in a safe and nurturing environment. Life is full of choices. Allowing children to choose the activities they love helps children develop good social skills, build character, and learn about themselves. Our program allows children to experience a variety of activities that stimulates the creativity and individuality of each child. Helping each child to develop the characteristic of kindness, compassion, generosity, patience, forgiveness, and self-control is a priority. Island Time Kids is directed by Cheryl Snyder. Our caring, skilled staff provide activities that assist children with strong, positive personal development, values exploration, decision making as well as opportunities for interacting with each other. Through a full range of educational, recreational and social activities, our program is designed to provide a balance between structure and spontaneity in a fun-loving community atmosphere. 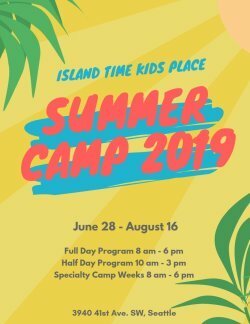 Games, crafts, drama, science, homework assistance, meditation, yoga, self-defense classes, free play and specialty classes are just some of the activities your child will have the opportunity to experience at Island Time Kids.